Bottom Line Store is passionate about helping customer’s live a happier, healthier lifestyle with a curated selection of high quality personal-care, household and organic products. 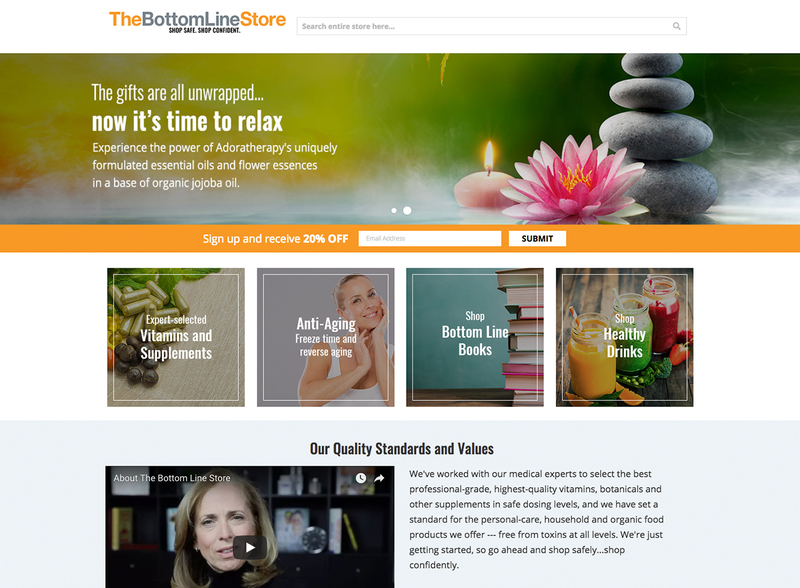 Bottom Line Store takes the stress out of buying products for a healthy lifestyle. Bottom Line Store came to us when they began facing a lot of challenges with their previous Magento 1.x framework, particularly with how this framework interacted with their order fulfillment system. Their primary goal was to streamline how their Magento system and fulfillment system interacted so that they could run their business efficiently and spend more time focusing on their marketing efforts. They needed a system that would integrate multi-warehouse and drop shipping systems within their Magento system. When Bottom Line Store first came to us we tried to see how we could work within their existing Magento 1.x system to achieve their goals, but in our research phase we quickly found that a migration to Magento 2 was going to be the best long-term solution in terms of simplifying their system and integrating the features they needed to run their business. We also spent time optimizing the overall user experience and site content so that their customers could move around the site as a whole in a more intuitive way. Our project management team was able to successfully fluctuate the scope of this project as needed throughout development. We were able to anticipate the changing needs that arise during a Magento 2 migration and successfully include all of the features that the client needed to run their business. We completed all development in time for the critical Black Friday shopping date. Now, that the client has a clean, intuitive system that they feel comfortable using, they are able to focus on their marketing campaigns and have a store they feel proud to drive traffic to. The Bottom Line Store has a large and eclectic catalog. Because of this, it is crucial that customers can effectively search the store to find the products they are looking for. We integrated improved site-wide search functionality with the Celebros extension and restructured their product data to include additional attributes for advanced searching. The new search features are more dynamic and make it simple for their customers to find the products they are looking for and complete their purchases. The Bottom Line Store came to us using a custom built order fulfillment system that was coded in an outdated language and struggled to integrate with their Magento system. We moved them to a modernized, managed system provided by Logicbroker that integrates seamlessly with their new Magento 2 system. Moving to this system has allowed The Bottom Line Store to automate a lot of their internal processes that previously would have required a customer service representative. Want to start reaching your eCommerce goals? Talk to a member of our strategy team today to get started on your Magento development project. Email us, connect through our live chat or call: 303.473.4400 to talk to a real person right now.